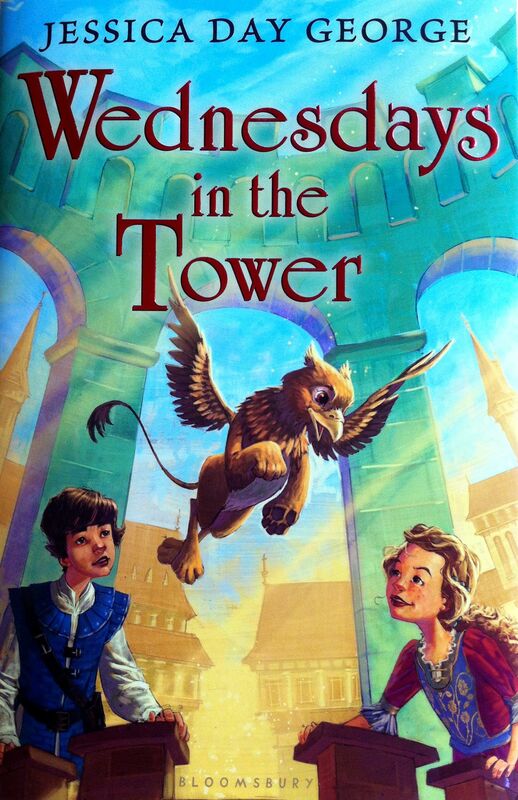 This is the sequel to one of our favorite chapter books, Tuesdays in the Castle. We return to magical Castle Glower, and to Celie (a strong and resourceful young princess) and her family. Castle Glower is behaving strangely. Oh, it still is creating new rooms, or moving rooms around on Tuesdays (when King Glower, Celie’s father, hears petitions), but the castle is doing peculiar things that start to worry the royal family. Castle Glower shows Celie a new tower room (on a Wednesday), reached by stairs that go beyond the school room, and only appear to Celie. And, there is an egg – Celie is sure it is an egg – shaped like a pumpkin, and orange, and hot, resting in the middle of the room. Celie is not sure what kind of egg it is, and hopes it won’t turn out to be a dragon egg. Still, Celie is drawn to the egg. She brings up blankets and pillows, and spends time sitting with the egg, reading, and talking to the egg. The castle brought her to the egg, and isn’t showing it to anyone else, so Celie is sure the castle wants her to take care of it. When the egg hatches, and the baby griffin imprints on Celie, things get pretty tricky. Celie manages to get the baby griffin, whom she names Rufus, to her room, but runs into her elder brother, Bran, the royal wizard on the way. Celie swears Bran to secrecy, and Bran puts a spell on her door to make people think they’ve already done what they came to do, and continue on their way. Castle Glower approves of Celie telling Bran, and Pogue (a family friend), but won’t let her tell her parents or her other brother or sister — when she tries to tell any of them, the castle slams a door, or drops something down a nearby chimney. Celie and her other brother, Rolf, begin looking for clues to Castle Glower’s history – why is there a griffin on the flag? Where do the rooms come from, and where do they go when the castle makes them appear and disappear? Celie and Rolf collect everything they can relating to the history of the castle, and everything they can find with griffins on it – tapestries, pillows, even an anvil. Castle Glower responds by cleaning up her room, repairing damage Rufus has done to it, providing water and food for him, and a new feather bed for Rufus. The castle also adds a new door in her room, leading up to a new tower – with empty space, woven floor mats, assorted toys, and a water dish – a new playroom for Rufus. Castle Glower continues to do strange things – special rooms appear out of season; a second stables appears – one that doesn’t seem built for horses; rooms shift in ways that make getting around the castle more difficult; and Celie and her family become more aware of a twisting sort of feeling in their heads each time the castle moves rooms, or changes. The arrival of a high wizard, whom the royal children don’t trust, adds to the feeling that something is wrong. Celie feels that Castle Glower is in danger. Readers learn some history of Castle Glower – where it came from, how it got there, and even a bit about where the rooms are when they aren’t in the castle with Celie and her family. Rufus grows rapidly and learns to fly – Celie learns to ride him. The book ends with Celie, Rufus, and some trusted siblings and friends at the beginning of a new adventure – one that will save Castle Glower from whatever danger it faces. I look forward to reading the next book in this series. Tuesdays and Wednesdays sound like such interesting books. Wish these would have been around when I was a kid! Going to recommend them both to my daughter who teaches 6th grade. Thanks for sharing on the Kid Lit Blog Hop. Cheryl – Hop Hostess. Thanks for stopping by from the Kid Lit Blog Hop! I hope your daughter and her students like the books. They are wonderful stories for mid-and-upper elementary readers (and adults). Absolutely love the sound of these books. I will be putting them on the to read list. Thanks so much for linking them in to the Kid Lit Blog Hop. Ooh, these sound so good – love the elements of fantasy! Thanks for sharing in the Kid Lit Blog Hop.